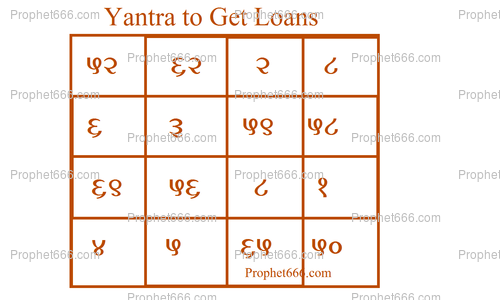 I describe a special Occult Yantra to Get Loans or Karz Prapti Yantra in this post. Many readers write to me from time to time on ways and means to get easy credit for their personal or business needs and hopefully this Yantra will address their needs, however, there is a special Tantra, which has to be performed to make this Yantra Experiment succeed, which is described below in this post. The Tantra is uncomplicated, the practitioner has to draw the numerological Yantra given in the image 1001 times on a Bhojpatra with the Pointed Stick of the Peepal Tree [Sacred Fig Tree in English] with Saffron Paste, These 1001 Yantras have to be then collectively worshipped by offering then Dhoop, Diya and Perfumed Flowers and the all except the last Yantra have to be immersed in the flowing water of a rive or canal. The Last Yantra has to be put in a Metal Locket and worn around the neck as a money attraction amulet. 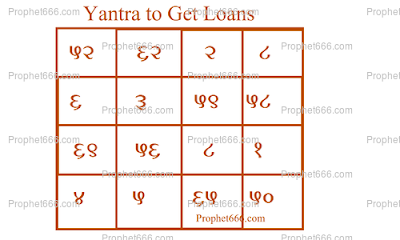 This Yantra Prayoga is said to enable the loan application or request for credit to materialize quickly. The Yantra is also believed to pocess Daridra Nashak properties and is helpful in removing money related hardships.